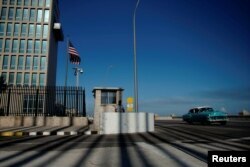 People wait in line to enter the U.S. embassy in Havana, Cuba, March 18, 2019. "It will cause great harm to Cuban civil society, the very sector driving changes to the island's political and economic structures," he said. A vintage car passes by the U.S. embassy in Havana, Cuba, March 12, 2019.